AdPR students and faculty at eBay headquarters in San Jose, California. AdPR students looking to enhance their education were selected for a 3-day immersive experience in California’s Silicon Valley over winter break. Through the new Grady AdPR partnership with eBay and help of UGA alum Suzy Deering (CMO of eBay), students were connected with a number of industry giants including eBay, Facebook, Google, Pinterest, Imgur, and Kiip. Students also toured the Verizon Innovation Center to see demonstrations of some of the latest technology innovations for communications. Program participants had their marketing, sales, and tech industry questions answered by leading experts in the field. AdPR students talk with Brian Wong, founder and CEO of Kiip. Caroline Youngs, a senior Advertising major, said her favorite aspect of the trip was learning about the new opportunities within the virtual and augmented reality space. She is specifically interested in the marketing of these new technologies. “The networking opportunities provided by the University, and connections that were made as a result, were invaluable for us all,” said Youngs. “Hopefully there will be a future in Silicon Valley for some or all of the participants. It was an incredible educational experience and I am so thankful for the opportunity!” The attentiveness, professionalism, and enthusiasm of the students on this trip truly reflected the excellence of Grady students. 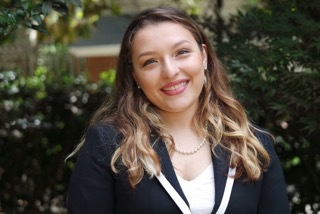 Ananda Costa, a recent graduate with a degree in public relations and a New Media certificate from Grady College, is one of the top students selected for Lockheed Martin’s two-year rotational Communication Leadership Development Program. Throughout her time in Grady College, Ananda gained valuable experience in her leadership roles including the co-director of AdPR Connection and director of outreach for TEDxUGA. Lockheed Martin’s Communication Leadership Development Program is designed for selected individuals to gain experience and knowledge in corporate communications. Participants have the opportunity to be immersed in the world’s top advanced technology company. While completing this program, participants are encouraged to continue their education with provided tuition to obtain their master’s degree. Lockheed Martin hopes to mold future company leaders through this exclusive program. “I am so honored to have been selected for Lockheed Martin’s Communications Leadership Development Program. Grady has a proud history of having several students participate in this prestigious initiative. In fact, I couldn’t have gone through the rigorous interview process without the encouragement of exceptional Grady professors, alumni and PRSSA. Having a strong support system of people who helped proof my application materials and provide me with program insights gave me an edge throughout the application process. I am so grateful to Grady and can’t wait to begin my Lockheed journey working with the Space team in Denver soon," said Ananda. We look forward to supporting Ananda in her future success in Lockheed Martin’s Communication Leadership Development Program. 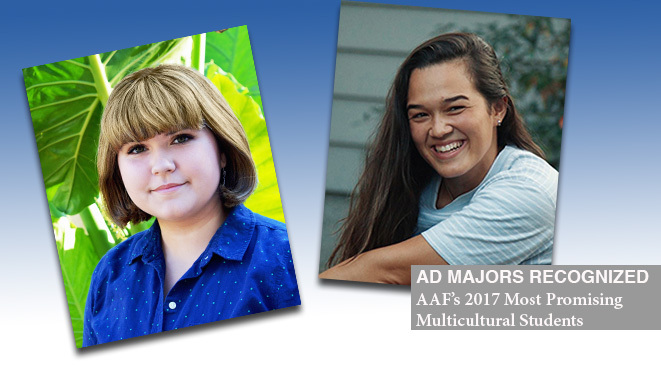 Two Grady College advertising majors have been named to the American Advertising Federation’s (AAF) 2017 Class of Most Promising Multicultural Students (MPMS). Emily Laramy and Savannah Rabin are part of the elite group of 50 students from AAF’s college chapter network who were selected for the program through a vetted application process that included essays, letters of recommendation, resumes and specific academic requirements. In addition to the recognition, the MPMS program includes a four-day industry immersion in New York City designed to promote diversity and inclusion within the advertising and marketing-related industries. It includes professional development workshops, agency visits and a recruiter’s expo. Both students attribute much of their success to Grady College and its faculty. With an average GPA of 3.6, this year’s MPMS Class represents 34 schools and 20 states across the country, according to a news release from the AAF. Leading agencies and companies have utilized MPMS year over year as a recruitment tool, including BBDO, DigitasLBi, Google, Leo Burnett, Omnicom Group, Pepsico, Turner and Wieden+Kennedy, among many others. Kim Nguyen (ABJ ’16) was a member of the 2016 MPMS Class.